Click above to see larger please! This may be one of the best photos I've taken of Sammy despite the fact he wouldn't smile for me. Mr. Sam is notoriously camera shy -- as soon as he says a lens or iPhone pointed at him, it's goodbye Mr. Grinface. 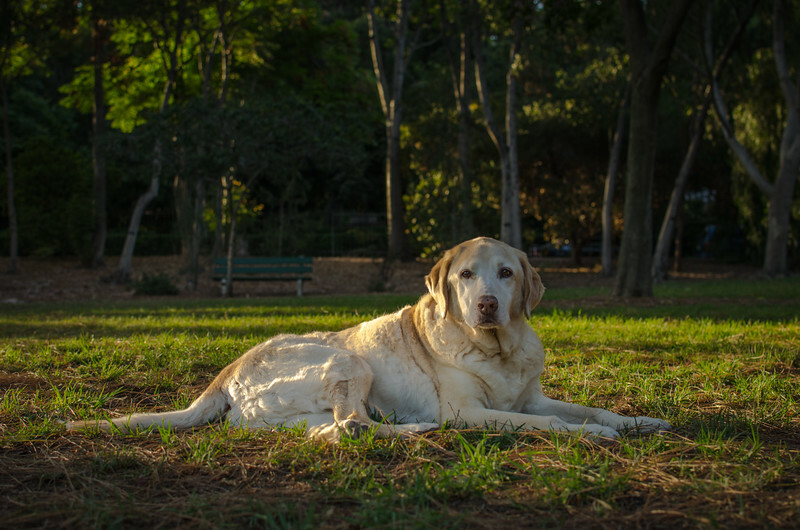 I take Sammy frequently to Lacey Park in San Marino - it's hard not to notice how wonderful the light is at the park, especially in the last two hours of the day when sunlight is filtered through the trees. This spot is in a small grove of pines and I chose it because it's a little secluded and I liked the bench in the background. On two occasions the sun hit Sammy directly and I just held down the shutter release and hoped to get a good dog-face expression from him. Camera and settings: Nikon D5100, Nikon DX 35mm 1.8 lens, 1/250th shutter speed, f/3.5, ISO 250. I shot in RAW, as usual, and processed the photo in Lightroom 4. Note: the Nikon DX 35mm lens is a really great lens and it only cost $199. In hindsight, I probably could have employed a little more depth of field. If you were standing in this spot, everything would be in focus. In this case, I was trying to keep the focus on Sammy and trying to downplay a pair of parked cars on the street beyond the fence. Another dog portrait tip: Sam gets some eye schmutz that builds up. I didn't notice until processing. I should have brought some kleenex and wiped down his eyes ahead of time. Yeah, I know -- sounds a little over-the-top. But if your dream is to get your dog on the box of some dog product, you gotta think of everything!